Tumor necrosis factor is a proinflammatory cytokine that induces directly many of the components required for inflammation to proceed rapidly. We show in this study that the interplay between TNF and chemokines, now recognized to be essential for normal secondary lymphoid tissue development, is also a feature of CNS inflammation, and that the two apparently dissimilar biological processes share many properties. Thus, induction of seven chemokines, including T cell activation gene 3 (TCA3), monocyte chemoattractant protein-1, and IFN-γ-inducible protein-10 within the CNS during experimental autoimmune encephalomyelitis fails to occur early in the inflammatory process in TNF-deficient mice, despite local expression of monokines and IFN-γ. The critical source of TNF in CNS inflammation is the infiltrating hemopoietic cell, and, in its absence, chemokine expression by irradiation-resistant CNS-resident cells fails. The CCR8 ligand, TCA3, is shown to be produced predominantly by resident microglia of the CNS in response to TNF. Using CCR8−/− mice, evidence is provided that TCA3-CCR8 interactions contribute to rapid-onset CNS inflammation. Thus, through TNF production, the hemopoietic compartment initiates the signals for its own movement into tissues, although the tissue ultimately defines the nature of that movement. Chemokines are a major, although not exclusive, mechanism by which tissues regulate leukocyte movement in response to TNF. Tumor necrosis factor displays numerous, mostly proinflammatory activities (1, 2). 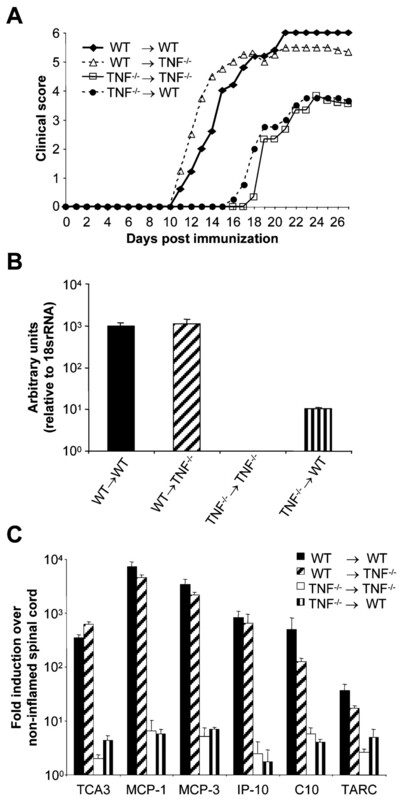 Consistent with this, mAb or soluble TNFR-based TNF neutralization in vivo ameliorates autoimmune inflammation (3, 4, 5) and can render mice (6) as well as humans (7) more susceptible to intracellular bacterial infections. The reasons are considered straightforward; TNF is necessary for development of normal immune responses at a broad level (e.g., induction of chemokines, other cytokines, adhesion molecules, MHC expression, apoptosis) that drive and regulate inflammatory and bactericidal effector pathways (1, 2, 8). Analysis of TNF (TNF−/−) and TNFR I gene-targeted mice confirmed the important role TNF played in autoimmune inflammation (1, 5, 9, 10, 11) and infection (12, 13). However, why these mice displayed a level of resistance to autoimmune inflammation and increased susceptibility to bacterial infection was not immediately obvious. All immune mechanisms tested in these mice, including Ab production, adhesion molecule expression, cytokine production, and Ag processing, were normal or near normal (10, 11, 14, 15) or even slightly increased in the case of T cell responses (2, 11) in the absence of TNF activity. Clues to the pathway(s) truly dependent upon TNF activities came instead from the observation that mice lacking TNF (14, 15) or TNFR I (16) had a degree of lymphoid disorganization at the microarchitectural level that resembled that seen in mice lacking BLR1 (CXCR5), the receptor for the B cell chemokine BLC (17). Prominent in TNF−/− mice was loss of primary B cell follicles in spleen, lymph node, and Peyer’s patches, but with lymphocyte phenotype and frequency within these tissues virtually normal. Further to this, our analysis of experimental autoimmune encephalomyelitis (EAE)4 (9, 10) and pulmonary Mycobacterium tuberculosis infection (13) in TNF−/− mice showed that the only component of the inflammatory pathway that failed was the movement of leukocytes within the target organ. Thus, in EAE, disease onset was delayed in TNF−/− mice relative to wild-type (WT) mice, and this was accompanied by an unusual histopathological outcome (9, 10). First, at the time of disease delay in TNF−/− mice, comparable number and phenotype of inflammatory leukocytes were isolated from the whole CNS of both WT and TNF−/− mice, despite the fact that TNF−/− mice were clinically healthy. Unlike WT mice, however, inflammatory leukocytes in the TNF−/− CNS could not be detected at the histological level. Precise anatomical location of leukocyte accumulation at this time has yet to be resolved. Given that Ag presentation to T cells and early leukocyte accumulation occurs in the perivascular space of meningeal vessels and smaller CNS capillaries before onset of EAE (18, 19, 20) suggests that these locations represent likely sites of leukocyte retention in TNF−/− mice. In any event, these observations demonstrated that a TNF-dependent event critical to normal disease development was leukocyte movement creating typical perivascular CNS inflammation. Second, when onset of disease did occur in TNF−/− mice, leukocytes were then detectable at the histological level as perivascular accumulations (cuffs) of leukocytes, but the nature of these cuffs remained distinct from that of WT mice. Thus, in TNF−/− mice, leukocytes remained tightly clustered around vessels, with limited movement of cells into the CNS tissue parenchyma. These outcomes have been reproduced by others (21). From these studies, a theme emerged where generation and movement of naive lymphocytes or inflammatory cells to secondary lymphoid tissues or target tissues respectively occurred apparently normally in the absence of TNF, while the movement of leukocytes within tissues failed. TNF has been shown to induce chemokine gene expression both in vitro (22) and in vivo (23), although it is only one of a number of other factors including IL-1 and IFN-γ that exhibits this property. However, in light of the similarities between mice lacking TNF or BLR1 (14, 15, 17), one interpretation was that chemokine expression in vivo, at least in steady state lymphoid tissue development, required absolutely an upstream signal from TNF. Furthermore, the implication was that this property of TNF was nonredundant. Our assessment of chemokine mRNA levels in the spleen of TNF−/− mice supported this view, although the data indicated dependency of chemokine expression was selective, with many chemokines expressed at near normal levels in the absence of TNF. Thus, using relatively insensitive Northern blot analysis (24), we demonstrated that expression levels of key B cell (BLC) and T cell (CCL21/6ckine/SLC and CCL19/macrophage-inflammatory protein (MIP)-3β/ELC) homing chemokines were reduced in TNF−/− mice, accounting for the defects in lymphoid cell organization seen in these mice. More recent analysis (25) using TaqMan quantitative PCR extended this list to the chemokine monocyte chemoattractant protein-1 (MCP-1), which was reduced 4-fold in TNF−/− spleen relative to WT spleen. In view of the consistent leukocyte-movement defect phenotype in mice deficient in TNF or TNFR I, a logical hypothesis proposed previously (26) is that a dominant and substantially nonredundant activity for TNF in vivo is regulation of leukocyte movement through control of chemokine expression. Evidence for this is lacking. We report in this study a substantial body of data confirming this concept and showing that the interplay between TNF and chemokine induction necessary for lymphoid tissue development is also a feature of CNS inflammation. Notable is that both physiological processes require TNF production by hemopoietic cells (B lymphocytes in lymphoid tissue neogenesis) (27), which in turn induces chemokine production by stromal cells, for example, follicular dendritic cells in spleen (28), and glial cells, including microglia, in the CNS. Based upon these and earlier studies in mice producing only membrane-bound TNF (25), a linear model for development of CNS inflammation is described. C57BL/6.TNF−/− mice (15) were bred in-house and maintained under specific pathogen-free conditions in microisolator cages at the DNAX Animal Facility. Control WT C57BL/6 mice were bred in-house or obtained from The Jackson Laboratory (Bar Harbor, ME). The 129/C57BL/6 chimeric mice carrying an induced CCR8 gene deletion (29) were bred directly to 129SvEv mice (Taconic Farms, Germantown, NY) and screened by PCR to obtain homozygous CCR8−/− mice on a 129SvEv inbred background. Control WT 129SvEv mice were purchased from Taconic Farms. Adult (>7-wk-old) female mice were used in all experiments. All animal procedures were approved by the DNAX Institutional Animal Care and Use Committee. EAE was induced actively by s.c. injection of myelin oligodendrocyte glycoprotein (MOG) peptide in CFA (day 0) and i.v. injection of 100 ng of pertussis toxin on days 0 and 2, essentially as described previously (10). Animals were monitored daily, and neurological deficits were quantified on a scale from 0 to 6 (10). These were generated between WT and TNF−/− mice, as described previously (10). As a means of determining successful engraftment, before each experiment, irradiated WT C57BL/6.CD45.2 mice were reconstituted with bone marrow from congenic C57BL/6.CD45.1 mice. Peripheral blood was drawn from the recipients and analyzed by flow cytometry for the presence of the CD45.1 congenic marker on leukocytes. At ∼8 wk after reconstitution, typically 100% of granulocytes, 100% of monocytes, 100% of B cells, and 90–95% of T cells were of donor type. The following mAb and isotype-matched control Abs were from BD PharMingen (San Diego, CA): purified rat anti-mouse CD4, purified or FITC-conjugated rat anti-mouse CD11b, FITC-conjugated rat anti-mouse CD3, FITC-conjugated rat anti-mouse B220, PE-conjugated mouse anti-mouse CD45.1, and biotinylated hamster anti-mouse T cell activation gene 3 (TCA3) (clone 1A6). Polyclonal rabbit anti-glial fibrillary acidic protein (GFAP) was purchased from Sigma-Aldrich (St. Louis, MO). Flow cytometric analysis of bone marrow engraftment in chimeras was performed on peripheral blood leukocytes. Cells were incubated with PE-conjugated mouse anti-mouse CD45.1 and one of the following FITC-conjugated mAbs: anti-CD3 (T cells), anti-B220 (B cells), anti-CD11b (monocytes, granulocytes, and NK cells), or their appropriate isotype controls. Flow cytometric data were acquired on either a FACScan or FACSCalibur (BD Immunocytometry Systems, San Jose, CA) and analyzed using CellQuest software (BD Immunocytometry Systems). Dissected spinal cords were embedded in OCT compound (Tissue Tek; Miles, Elkhart, IN), snap frozen in liquid nitrogen vapor, and stored at −80°C until required. Serial cryostat sections (8 μm) were prepared and fixed in acetone. For single Ag staining, the immunoperoxidase technique followed by hematoxylin counterstaining was used, as outlined previously (9). Purified rat mAbs reactive with the mouse surface Ags CD4 and CD11b were used and detected utilizing a HRP-conjugated donkey anti-rat Ig (Jackson ImmunoResearch Laboratories, West Grove, PA). Biotinylated hamster mAb reactive to mouse TCA3 was detected using the ABComplex/HRP (DAKO, Carpenteria, CA). Two-color immunohistochemistry was used for TCA3 colocalization studies using a protocol based on a method previously reported (30). Sections were examined using a Leica DMRE microscope (Leica Instruments, Nussloch, Germany) utilizing standard bright field optics, and photographed using a SPOT RT Slider digital camera (Diagnostic Instruments, Sterling Heights, MI) equipped with the SPOT RT (Diagnostic Instruments) software. Total RNA was isolated from whole spinal cord using RNA STAT60 (Tel-test, Friendswood, TX), according to the manufacturer’s instructions. A total of 5 μg of RNA was then reverse transcribed into cDNA in accordance with the manufacturer’s directions (Life Technologies, Invitrogen, Carlsbad, CA). Expression of the following chemokines: 6ckine, CTACK, eotaxin, fraktalkine, IFN-γ-inducible protein 10 (IP-10), LPS-inducible CXC chemokine, lymphotactin, MCP-1, MCP-3, MCP-6, monocyte-derived chemokine, monokine induced by IFN-γ (Mig), MIP-1α, MIP-1β, MIP-1γ, MIP-3α, MIP-3β, RANTES, thymus and activation-regulated chemokine, TCA3, P500/TCA3, and thymus-expressed chemokine at the mRNA level was then determined by quantitative real-time PCR using the ABI 5700 sequence detection system (PerkinElmer Applied Biosystems, Foster City, CA). Sense and antisense primers, together with reaction-specific probes, were obtained as predeveloped TaqMan assay reagents (PDAR; PerkinElmer) and used in association with TaqMan Universal PCR Master Mix (PerkinElmer), according to the manufacturer’s protocols. A full description of the PCR components and validation of the PDAR target reactions have previously been described (31). The 18S rRNA levels were measured for each cDNA sample as a means of normalizing chemokine mRNA expression levels. Basal (nonimmunized) spinal cord mRNA levels for all examined chemokines were similar for both WT and TNF−/− mice, with expression levels typically differing by no more than 2-fold. Therefore, chemokine mRNA expression data are expressed as fold induction over noninflamed WT spinal cord. In all analyses, only differences greater than 4-fold (>2 PCR cycles) were considered significant. All results are expressed as mean ± SEM. In the analysis of TaqMan data, differences greater than 4-fold (>2 PCR cycles) were considered significant. To determine whether the differences in onset of EAE between groups of mice were significant, a Student’s t test was performed. Value of p < 0.05 was considered statistically significant. Following s.c. immunization with 50 μg of MOG 35–55 peptide in CFA, and administration of pertussis toxin i.v. on days 0 and 2, WT mice reproducibly developed a severe, acute encephalomyelitis with clinical signs of disease appearing at ∼day 12 and peaking at ∼day 18 (Fig. 1⇓A). In response to immunization, TNF mRNA in the CNS was increased above background levels by day 8, 2–3 days before EAE onset (Fig. 1⇓A). Clinical signs of disease in TNF−/− mice (Fig. 1⇓A) were delayed by ∼5 days, peaking in severity at ∼day 23 (9). Disease in both WT and TNF−/− mice then remitted to leave a mild, chronic, nonrelapsing deficit. The overall duration of disease was reduced in TNF−/− mice. Characteristics of MOG 35–55 peptide-induced EAE in C57BL/6 WT and TNF−/− mice. A, Disease curves for WT (n = 6) and TNF−/− mice (n = 7). Mean clinical scores ± SEM plotted against days PI. Respective peaks of disease are indicated (▾ and ▵). TNF mRNA levels (broken line) in the spinal cord of WT mice (n = 3 per time point) were determined by quantitative real-time PCR and are expressed in arbitrary units relative to 18S rRNA levels. Error bars represent SEM. B, Impaired inflammatory leukocyte movement in the CNS of TNF−/− mice at the peak of disease. Cryostat sections of spinal cord taken from WT and TNF−/− mice taken at the peak-of-disease time points indicated in A. The scale bar denotes 100 μm. Examination of CNS inflammatory lesions (Fig. 1⇑B) at the corresponding peaks of disease in WT (day 18) and TNF−/− (day 23) mice showed defective leukocyte distribution in TNF−/− mice (9, 21). Inflammatory macrophages remained strikingly congested in close association with the vasculature in spinal cord lesions from TNF−/− mice (Fig. 1⇑B, lower left panel). These cells are distinct from the more ramified, CD11b+ microglia in the CNS parenchyma. In WT mice, inflammatory macrophages distributed normally throughout the parenchyma at the peak of disease. However, not all cell types were similarly affected. A novel observation, not previously presented, was that movement of CD4+ cells (T cells) was unrestricted in TNF−/− mice, entering the CNS parenchyma as in WT mice (Fig. 1⇑B, right panels). To ascertain whether a defect in chemokine induction could account for the delay in onset of clinical signs of disease, and the impaired leukocyte movement seen in TNF−/− mice with EAE, chemokine mRNA levels in spinal cord were assessed at selected time points following immunization. As illustrated in Fig. 1⇑A, onset of clinical signs of disease in TNF−/− mice was delayed relative to WT animals. At day 14, WT mice exhibited clinical signs of disease, while TNF−/− mice appeared clinically normal. We have previously reported that similar numbers of inflammatory cells can be isolated from the CNS of both WT and TNF−/− mice at this time (9). Consistent with this, mRNA levels for CD4, TCRβ, IFN-γ, IL-1, and IL-6 were elevated in both groups of mice (data not shown). Examination of chemokine mRNA levels at day 14 revealed a number of chemokines that were up-regulated relative to basal levels, and these chemokines displayed three distinct profiles of expression (Fig. 2⇓). Profile 1 (Fig. 2⇓A) is those chemokines that are dependent on TNF for rapid and optimal expression, CCL1 (TCA3), its splice variant, P500/TCA3, CCL2 (MCP-1), CCL7 (MCP-3), CXCL10 (IP-10), CCL6 (C10), CCL17 (thymus and activation-regulated chemokine), and CCL9/10 (MIP-1γ). This set of chemokines was up-regulated substantially in the spinal cord of WT mice at day 14, but remained at near basal levels in TNF−/− mice. Notably, a few days later, at or around the time of clinical disease onset in TNF−/− mice, expression levels of these chemokines became elevated. It is evident, therefore, that other pathways, albeit not as efficient as TNF, drive increased expression of these molecules. Early expression of a select set of CNS chemokines is TNF dependent. Chemokine mRNA levels in spinal cord of WT and TNF−/− mice at days 14 (n = 6) and 17 (pool of six spinal cords) PI were determined by quantitative real-time PCR. Mean mRNA expression levels are represented as fold induction over basal (nonimmunized spinal cord) mRNA levels. A, TNF-dependent chemokines, defined as chemokines failing to up-regulate in TNF−/− spinal cord, but highly expressed in WT spinal cord at day 14 when WT mice exhibit clinical signs of disease, but TNF−/− mice do not (cf Fig. 1⇑A). B and C, Chemokines substantially (B) or completely (C) independent of TNF; defined as those chemokines up-regulated in both WT and TNF−/− spinal cord at day 14. ∗, Denotes that MIP-3α was not expressed above basal levels at day 17 in TNF−/− mice. D, Early induction of chemokines in the presence of TNF. Chemokine mRNA expression levels at selected time points from day 8 to 24 PI were determined (n = 3–6 samples per time point). Profiles 2 (Fig. 2⇑B) and 3 (Fig. 2⇑C) are chemokines that are less dependent upon, or seemingly do not require, TNF for their induction. Thus, at day 14, CXCL9 (Mig) and CCL5 (RANTES) were expressed at higher levels in WT mice, but were greatly elevated in the spinal cord of TNF−/− mice (Fig. 2⇑B). Profile 3 chemokines (Fig. 2⇑C) were up-regulated in both WT and TNF−/− mice and showed no significant difference in expression at day 14. Spinal cord chemokine mRNA expression levels were measured over various time points from days 8–24 postimmunization (PI). In WT mice, TCA3, MCP-1, IP-10, and C10 mRNA were up-regulated in the spinal cord at least 8–10 days PI (Fig. 2⇑D), 2–4 days before onset of clinical signs of disease. This is most likely due to increased TNF expression in the spinal cord, where TNF mRNA levels were already elevated above basal levels by ∼10-fold at day 8 and 30-fold at day 10 PI (Fig. 1⇑A). In contrast, these same chemokines were not elevated in TNF-deficient mice until around the time of onset of clinical signs of disease (Fig. 2⇑, A and D). Consistent with this, detected on a number of occasions in time course studies was a first small accumulation of perivascular leukocytes in CNS tissue samples from clinically healthy TNF−/− mice just before expected time of disease onset (data not shown). These tissues always contained chemokine mRNA levels above that found in mice assessed 6–12 h earlier. Thus, up-regulation of one or a combination of these chemokines appears essential for first histological evidence of inflammation and appearance of clinical signs of disease. It is of interest that despite the fact that up-regulation of these key chemokines in the CNS eventually occurred in TNF−/− mice, leukocyte congestion remained a feature of EAE in these animals (Fig. 1⇑B). 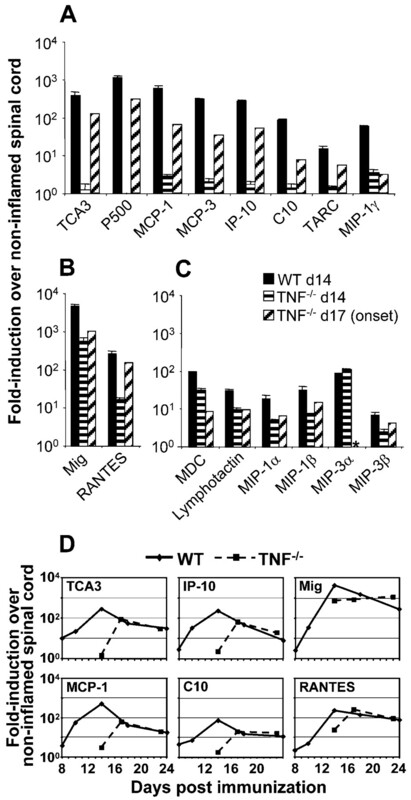 Despite the induction of Mig, RANTES, and a selection of other chemokines in TNF−/− mice already by day 14 (Fig. 2⇑, B–D), clinical disease was not initiated. Thus, these chemokines do not appear to be the critical players for early triggering of disease. Within the CNS, glial cells and, in particular, microglial cells produce TNF and are thought to contribute to CNS pathologies (32). To test which source of TNF was essential for chemokine induction and the development of EAE, we generated radiation bone marrow chimeras between WT and TNF−/− mice. Hemopoietically derived peripheral inflammatory cells, namely macrophages and T cells, are radiation sensitive, while microglia, the resident macrophage of the CNS, are largely radiation resistant (33), certainly within the timeframes used in this study. Four distinct chimeras were generated: 1) mice that had the capacity to secrete TNF from both hemopoietic and resident CNS cell sources (WT→WT); 2) mice that had hemopoietic cells able to secrete TNF, but lacked resident CNS cells with the capacity to secrete TNF (WT→TNF−/−); 3) mice that totally lacked TNF (TNF−/−→TNF−/−); and 4) mice that lacked a hemopoietic source of TNF, but were comprised of CNS resident cells with the capacity to produce TNF (TNF−/−→WT). TNF−/−→WT mice and TNF−/−→TNF−/− mice exhibited the delay in onset of EAE (Fig. 3⇓A) characteristic of TNF−/− mice (Fig. 1⇑A), highlighting the critical role played by TNF derived from inflammatory peripheral leukocytes. By contrast, WT→TNF−/− mice developed a disease indistinguishable from that of WT→WT mice (Fig. 3⇓A). At day 15, a great disparity in TNF mRNA levels existed in spinal cord samples from the different chimera groups. TNF levels in TNF−/−→WT mice were 100-fold lower than those measured in WT→WT and WT→TNF−/− mice at day 15 (Fig. 3⇓B). Analysis of spinal cord chemokine expression at day 15 (Fig. 3⇓C) revealed that hemopoietic TNF was required for the induction of the highly TNF-inducible chemokines described earlier (Fig. 2⇑A). Despite the presence of resident CNS cells capable of TNF secretion, TNF−/−→WT chimeras did not exhibit increased levels of these key chemokines, and their expression profile resembled that seen for TNF−/−→TNF−/− mice (Fig. 3⇓C) and TNF−/− mice (Fig. 2⇑A). Thus, blood-derived leukocytes contribute >99% of total TNF present within the inflamed CNS and are the essential source of TNF for typically rapid EAE induction. Hemopoietic TNF is required for early chemokine expression in the CNS. Radiation bone marrow chimeras were immunized with MOG 35–55 to induce EAE, and, at day 15, selected mice were sacrificed and spinal cords were removed. Spinal cord mRNA was analyzed by quantitative real-time PCR, as described in Fig. 2⇑. A, Mean EAE clinical scores for radiation bone marrow chimeras (n = 5 per group) vs days PI. B, Spinal cord TNF mRNA levels at day 15 PI. Data are presented as mean TNF mRNA levels (n = 3) ± SEM for each chimera group and expressed as arbitrary units, normalized to 18S rRNA. C, Spinal cord chemokine mRNA expression levels at day 15 PI. Data are presented as fold induction over basal levels (n = 3) ± SEM. As outlined above, induction of one or more of the TNF-inducible chemokines identified in Figs. 2⇑ and 3⇑ is required for the progression of EAE and onset of clinical signs of disease. Of these chemokines, protein expression by resident CNS cells following EAE induction has been reported for MCP-1 (34) and C10 (35), while IP-10 mRNA expression has been localized to astrocytes (36). Although up-regulation of TCA3 has been reported in EAE (37), its importance in the onset of this disease has not been extensively addressed. Because we found that TCA3 was one of the first chemokines up-regulated in EAE and was highly dependent on TNF for its early up-regulation (Figs. 2⇑A, 3, and 4C), we used a mAb directed against mouse TCA3 to identify a novel cellular source of this chemokine. 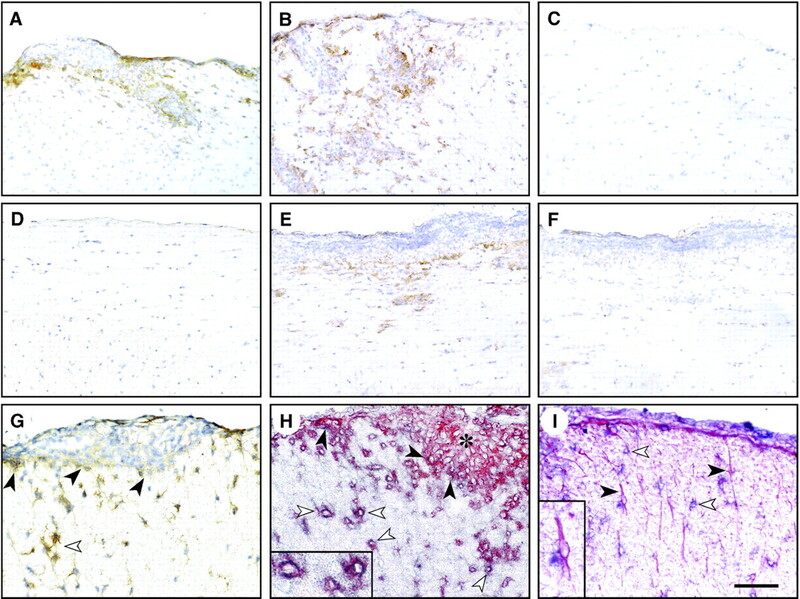 Immunohistochemical studies performed on spinal cord cryostat sections (Fig. 4⇓) correlated with TCA3 mRNA expression data. Immunostaining for TCA3 was associated with inflammatory infiltrates in specimens obtained from WT mice at day 14 PI (Fig. 4⇓A), but was not readily detectable in spinal cords from nonimmunized mice (Fig. 4⇓C), or tissue obtained from TNF−/− mice at day 14 (Fig. 4⇓D). TCA3 was detected in tissue taken at the corresponding peaks of disease for both WT (Fig. 4⇓B) and TNF−/− mice (Fig. 4⇓E). Although TCA3 has been reported as a product of T lymphocytes, staining was not associated with the bulk of inflammatory cells, but rather at the edge of the inflammatory infiltrate (Fig. 4⇓, A, B, and E). At higher magnification it became evident that TCA3+ cells were found mainly at the inflammatory infiltrate-parenchymal interface (Fig. 4⇓G, filled arrowheads), and within the parenchyma, the latter showing the morphology of glia (Fig. 4⇓G, open arrowheads). Two-color immunohistochemistry, in conjunction with Abs directed against astrocyte-specific GFAP and CD11b (to identify microglia/macrophages), was then used to determine the cellular source of TCA3. Colocalization of CD11b+ parenchymal cells (red) with TCA3 (blue) revealed that microglia were the major source of TCA3 in the spinal cord (Fig. 4⇓H). Thus, purple (red + blue) CD11b+TCA3+ cells at the infiltrate edge (filled arrowheads) and within the parenchyma (open arrowheads) were distinguishable from red-staining CD11b+TCA3− macrophages within the inflammatory infiltrate (Fig. 4⇓H, asterisk). In addition to astrocytes, microglia form up to 15% of the cells of the glia limitans that helps define the blood brain barrier (38). It is likely that it is these cells at the infiltrate-parenchymal interface that are TCA3+. Microglia are the predominant CNS source of TCA3 in the inflamed CNS. A–E, TCA3 staining of horizontal cryostat sections of spinal cord. A, WT day 14 tissue (early after onset). B, WT day 18 (peak of disease). C, Nonimmunized WT spinal cord. D, TNF−/− day 14 tissue (preonset). E, TNF−/− day 23 (peak of disease). TCA3+ cells are not apparent in nonimmunized WT spinal cord (C). F, TNF−/− day 23 spinal cord tissue (horizontal section) incubated with negative control mAb. G–I, Coronal sections of WT day 14 tissue. G, TCA3-positive cells have a ramified glial morphology within the deep parenchyma (white arrowhead) or are clustered at the edge of inflammatory infiltrates (filled arrowheads). H, Colocalization of TCA3 (blue) with CD11b-positive cells (red) yielding purple-stained cells in the parenchyma (white arrowheads; higher magnification shown in boxed region) and at the inflammatory infiltrate interface (filled arrowheads). Note how the purple-stained parenchymal CD11b+ cells are distinct from single red-staining CD11b cells (macrophages) in the inflammatory infiltrate (∗). I, No colocalization between astrocytes (red, filled arrowheads) and TCA3+ cells (blue, white arrowheads). Higher magnification shown in boxed region. The scale denotes 100 μm (A–F), 50 μm (G–I), and 25 μm (H and I, insets). The majority of GFAP+ astrocytes (red) did not colocalize with TCA3+ cells (blue) when this staining combination was performed (Fig. 4⇑I), indicating that astrocytes are not a major source of TCA3. Likewise, CD4+ cells were found not to be TCA3+ (data not shown). CCR8 is the only known receptor for TCA3 (39), and I-309, the human homologue of TCA3, appears to have only human CCR8 as a functional receptor (40). CCR8−/− mice, therefore, represent a good model system to address the role of TCA3 in the induction of EAE. EAE was induced in WT 129SvEv and CCR8−/− mice using the same protocol as that used to induce disease in C57BL/6 mice. Mean time of onset of clinical disease was significantly delayed in CCR8−/− mice relative to WT controls (Fig. 5⇓) by ∼2 days (mean day of onset: WT, 12.0 ± 0.3; CCR8−/−, 14.4 ± 0.4; p < 0.05). At 12 days PI, all but one of the WT animals that would develop clinical signs of disease had done so, while only one CCR8−/− mouse showed clinical signs of disease (Fig. 5⇓A). At day 14 PI, all of the WT animals that would develop clinical signs of disease had done so, compared with just over half of the CCR8−/− mice (Fig. 5⇓A). Although the time of disease onset was delayed and more variable in the CCR8−/− mice, overall the incidence of disease was comparable between the two groups (Fig. 5⇓A). 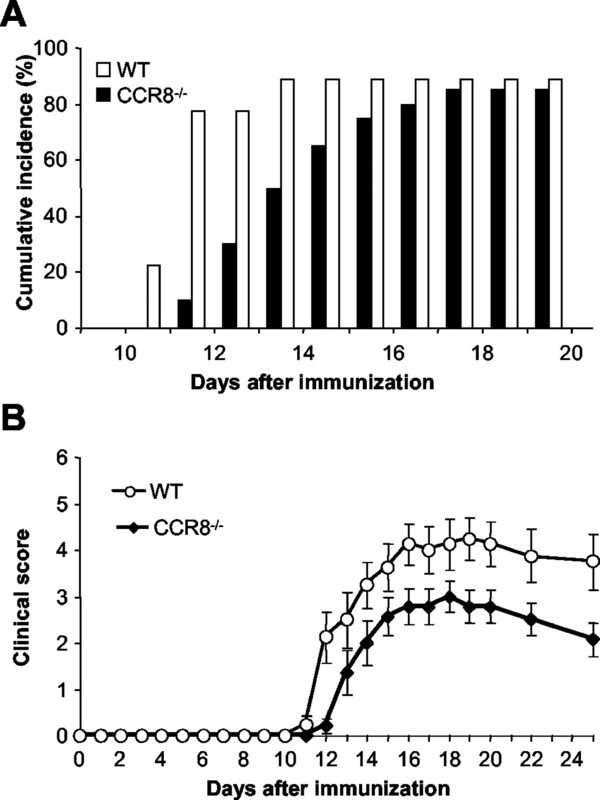 The severity of disease, however, was reduced in CCR8−/− mice compared with WT controls (Fig. 5⇓B). Thus, TCA3 interactions alone contribute to the normally rapid onset of disease and to the magnitude of disease. It is not surprising to see that the phenotype resulting from the loss of TCA3-CCR8 interactions is less dramatic than that observed in TNF−/− mice (Fig. 1⇑A) in which multiple chemokines are affected. Delayed onset of EAE in CCR8−/− mice. EAE was induced in WT 129SvEv and 129Sv/Ev.CCR8−/− mice. A, Cumulative incidence of disease. Onset of EAE in CCR8−/− mice is delayed. B, Mean clinical score ± SEM for WT (n = 9) and CCR8−/− (n = 30) mice. Like TNF−/− mice (Fig. 1⇑B), detectable leukocyte infiltration to the CNS was delayed in CCR8−/− relative to WT mice, suggesting that TCA3-CCR8 interactions contribute directly to the perivascular accumulation of inflammatory cells. Otherwise, upon onset of EAE, macrophage movement into the parenchyma of the CCR8−/− CNS was comparable to WT mice (data not shown). Defining activities of cytokines in an in vivo setting through analysis of phenotype resulting from loss of function mutations has often proven difficult. This is due in large part to the potential for a given biological activity to be mediated by more than one factor. For example, at least four cytokines have been reported to induce adhesion molecules on CNS endothelial cells in vitro (41). Thus, important activities of one cytokine, especially those activities defined through in vitro studies, may continue apparently uninterrupted in mice in which that one cytokine is lacking. In the analysis of cytokine gene-targeted mice, therefore, attention needs to be focused not to what stays the same, but to identification of physiological outcomes that change, even temporarily and even if subtle. It is these outcomes that point to the functions of a given cytokine that are truly essential. TNF is a case in point. It is generally accepted that TNF operates at many levels during an immune response, from up-regulation of adhesion molecule expression, to the activation of APCs and the induction of cytokines and chemokines (1, 2). Nevertheless, in its absence, most immunological pathways proceed relatively normally. Although onset of EAE in TNF−/− mice is delayed relative to WT animals (Fig. 1⇑A) (9, 10), this is not due to a defect in T cell priming or inflammatory cell recruitment per se; comparable numbers and phenotype of leukocytes can be isolated from the whole CNS of both TNF−/− mice and WT animals at any given time following immunization to induce EAE (9). TNF−/− mice also do not show a defect in up-regulation of adhesion molecules, such as VCAM-1 and ICAM-1, on CNS endothelium (data not shown) (9). TNF−/− mice do, however, show broad-based deficiencies in inflammatory leukocyte movement within the CNS, where cells are slow to accumulate as detectable cuffs around blood vessels and fail to move into the tissue parenchyma. In this study, we provide evidence indicating that the key role TNF plays in the instigation of autoimmune pathology is through the induction of chemokine production by resident cells in the target tissue. Comparison of spinal cord chemokine mRNA expression levels between WT and TNF−/− mice at selected time points after immunization to induce EAE revealed a number of chemokines, all reported mononuclear cell chemoattractants, which were dependent on TNF for optimal induction (Figs. 2⇑, A and D, and 3C). It is of interest that a number of the chemokines identified as being TNF inducible, and required for development of clinical signs of disease, have been implicated in the development of disease in EAE (reviewed in Refs. 42 and 43) as well as viral encephalitis (44). Up-regulation of TCA3 mRNA in the spinal cord of mice before the onset of EAE has been reported previously (37). The encephalitogenicity of T cell clones has also been correlated with TCA3 production (37, 45). We also found TCA3 to be induced in the spinal cord before onset of clinical signs of disease (Fig. 2⇑D) and in addition, found TCA3 to be highly dependent on TNF for optimal expression in the spinal cord (Figs. 2⇑, A and D, and 3C). Microglia were shown to be the major CNS source of this chemokine during autoimmune inflammation (Fig. 4⇑H), and this is consistent with a predominantly stromal source for chemokines in the inflamed CNS. Further to this, astrocytes have been shown to be a major source of both MCP-1 and IP-10 (36), and CNS endothelial cells have also been shown to produce MCP-1 during EAE (34). C10 production has been identified in the CNS during EAE, but, unlike MCP-1 and IP-10, which are astrocyte products, C10 has been localized to microglia and infiltrating macrophages (35). In contrast to C10, inflammatory macrophages were not a significant source of TCA3, nor were astrocytes (Fig. 4⇑I) or T cells (data not shown). TCA3+ microglia were, however, located in close association with inflammatory infiltrates (Fig. 4⇑, A, B, E, G, and H). This location has previously been noted for MCP-1+ and IP-10+ astrocytes (36), suggesting that localized production of chemokines by glia at the parenchymal-perivascular interface regulates inflammatory cell movement into the CNS. To further examine the role of TCA3 in the pathogenesis of EAE, we used CCR8−/− mice. Following immunization with MOG 35–55, CCR8−/− mice reproducibly showed a delay in onset of clinical signs of EAE compared with WT controls (Fig. 5⇑, A and B), highlighting a role for TCA3 in disease onset. Clearly, this chemokine does not itself play the dominant role proposed for MCP-1 or IP-10, but is one of a small subset of chemokines that contributes to the development of CNS inflammation. The precise role of TCA3-CCR8 interactions in supporting CNS inflammation remains undefined. CCR8 is expressed on CD4+ T cells, preferentially Th2 CD4+ T cells according to one report (46), although this does not fit well mechanistically with the observations in this study of delay in a Th1-mediated pathology. In contrast, CCR8 is highly up-regulated on activated macrophages and microglial cells in multiple sclerosis-affected CNS tissue (56). This expression profile, together with the delayed disease onset and CNS inflammation reported in this study, implies a role for TCA3 in early leukocyte extravasation and chemotaxis of monocytes/macrophages into the CNS. Direct activation of CCR8-expressing macrophages and glial cells by TCA3 is also possible. That macrophage movement out into the CNS parenchyma was normal in CCR8−/− mice, but failed in TNF−/− mice even after CNS chemokine expression reached WT levels (Fig. 2⇑, A and D), is consistent with the possibility that this process is TNF dependent, but substantially independent of chemokine expression (see below for further discussion). The predominant source of TNF in the CNS of mice around the time of clinical disease onset was of hemopoietic origin (Fig. 3⇑B), and this source was required for optimal chemokine induction (Fig. 3⇑C) and for typical onset of EAE (Fig. 3⇑A). A CNS source of TNF alone, in the absence of hemopoietically derived TNF (TNF−/−→WT mice), could not drive chemokine induction and, as a consequence, a delay in the onset of EAE typical of TNF−/− mice was observed (compare Fig. 1⇑A with Fig. 3⇑A). Although not altering these conclusions, it is important to note that there is some replacement of microglial cells from the donor bone marrow compartment such that by 16–20 wk after irradiation and bone marrow reconstitution, ∼10% of CNS cells with characteristics of microglia express the donor CD45 allotype (unpublished data). Therefore, in WT→TNF−/− chimeras, 10% of microglia could in principle be producing TNF. Whether this small proportion of microglial cells contributed significantly to the rapid onset of disease seen in these mice is not known, although improbable. Likewise, in TNF−/−→WT chimeric mice, ∼90% of microglial cells could in principle produce TNF, and 10% not. Again, it is unlikely that it was this 10% of TNF−/− microglia that rendered these mice similar in EAE susceptibility to complete TNF−/−→TNF−/− mice. Thus, while it is possible that microglia may represent an early source of TNF following EAE induction (32, 47), our results suggest, nevertheless, that TNF production by resident CNS cells is not sufficient to support chemokine induction. Our findings point to a role for TNF derived from inflammatory leukocytes in driving local chemokine production within the CNS and thereby initiating the recruitment of inflammatory cells and movement into the CNS. Some broad concepts can be deduced from this study and an earlier analysis of the development of EAE in the presence only of membrane-expressed TNF (25). These are illustrated in Fig. 6⇓, which represents a simple linear model of development of CNS inflammation. First, TNF most efficiently drives the inflammatory process of movement of leukocytes into and within CNS tissue. TNF is derived from hemopoietic cells in the blood, presumably produced by early appearing T cells and monocytes (I). This TNF induces glial cells to produce chemokines such as MCP-1 and TCA3 (II) that is necessary for the accumulation of leukocytes (macrophages and T cells) around vessels into a perivascular location (III). It should be noted that TNF is not alone in its chemokine-inducing capacity. Many chemokines are expressed normally in the absence of TNF, and even those that seem very TNF dependent for induction are seen eventually within the inflamed CNS in TNF−/− mice. Nevertheless, alternative means to induce these critical chemokines are inefficient. Hemopoietic TNF drives chemokine production by resident CNS stromal cells. I, TNF from macrophages (Mφ) and possibly T cells (T) acts upon resident CNS cells, particularly astrocytes and microglia (II), inducing chemokines, namely MCP-1 and TCA3. This enables accumulation and cuffing of inflammatory leukocytes around vessels (III), and disease onset. Membrane-bound TNF is sufficient to induce this phenotype (25 ). Movement of Mφ into the tissue parenchyma (IV) completely fails in the absence of TNF, or in the presence only of memTNF (and therefore requires soluble TNF). TNF-dependent signals in addition to chemokines are required for IV. Second, the expression of a small set of chemokines early in the inflammatory process is the essential step in development of clinical disease. That is, in TNF−/− mice, in which inefficient induction of disease in the absence of TNF enables a window of assessment, expression of chemokines such as TCA3, IP-10, and MCP-1 in the CNS is seen first virtually contemporaneously with disease onset (e.g., Fig. 2⇑, A and D). Presumably, these events also occur in WT mice, but with a strong TNF signal for chemokine induction; the process would proceed extremely rapidly and be difficult to capture. It is not clear what underlies the link between visible leukocyte accumulation and neurological deficit. Third, membrane-expressed TNF alone is sufficient for these early processes to occur normally. Mice expressing only membrane TNF (uncleavable, membrane-expressed TNF (memTNFΔ/Δ) mice) show normal time of onset of EAE and histological appearance of inflammation (25) as well as normal CNS chemokine induction (unpublished data). Even when the immunization strength is reduced by using less CFA, which results in a lower overall magnitude of EAE in memTNFΔ/Δ mice, disease onset occurs at the same time as WT mice (25). Fourth, the TNF dependency of T cells vs macrophages for movement from the perivascular space into the CNS parenchyma differs. In the absence of TNF, CD4+ T cells move into the parenchyma, while macrophages predominate in the congested cuff typical of EAE in TNF−/− mice (Fig. 1⇑B). In contrast, TNF is necessary for macrophages to leave the perivascular region and move into the CNS parenchyma. Normal macrophage movement also fails in memTNFΔ/Δ mice (25), suggesting that soluble TNF is required (stage IV). Finally, despite eventual up-regulation of chemokines in TNF−/− mice and disease onset (Fig. 2⇑, A and D), macrophages remain confined to the perivascular region (Fig. 1⇑B, bottom left panel). Thus, this stage of the inflammatory process (stage IV) is TNF dependent, but apparently independent of chemokine expression. 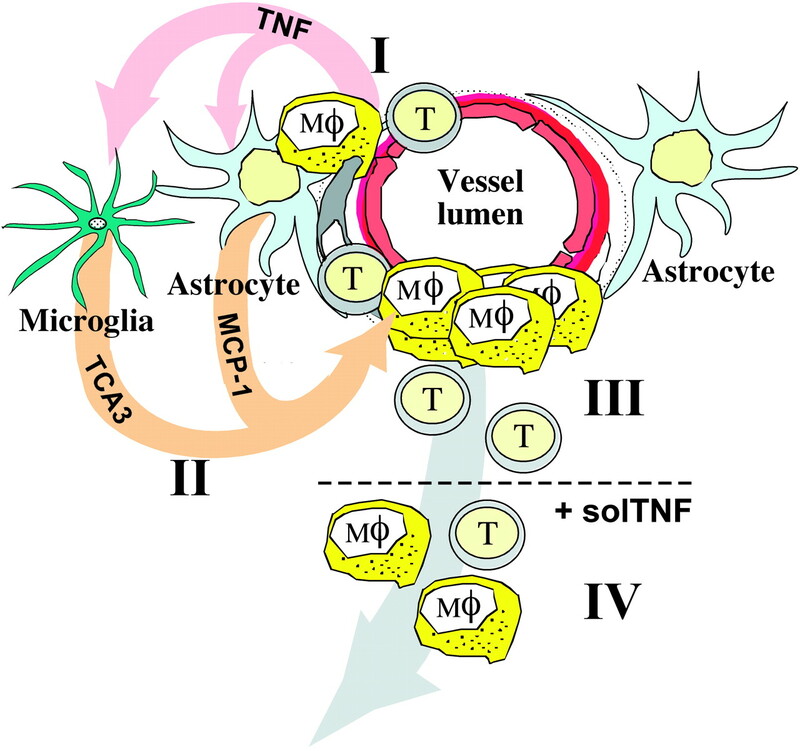 There are numerous possible mechanisms through which soluble TNF may facilitate this process, including macrophage activation directly (48) and induction of factors such as matrix metalloproteinases that could facilitate cell movement across glial barriers and through the extracellular space (49). Our analysis of CNS gene expression for these and other molecules, including chemokine receptors, known to be TNF inducible, has not revealed obvious deficiencies in TNF−/− mice that could explain the leukocyte congestion phenotype. The results presented in this work indicate that a key role for TNF in the initiation of CNS inflammation, and presumably in other autoimmune diseases, is through the induction of chemokines. Furthermore, the interplay between TNF and chemokines, and the respective hemopoietic/stromal cellular sources of these factors in CNS inflammation is highly reminiscent of that seen in lymphoid neogenesis (27). Targeting of specific TNF-inducible chemokines or preferably their receptors, perhaps in concert with anti-TNF-based therapies, may represent a valid therapeutic approach for treatment of CNS inflammatory disease, multiple sclerosis especially. In this context, alternatives to TNF-directed therapies for the treatment of CNS inflammation are desirable in view of clinical studies showing that TNF blockade is either ineffective (50) in the treatment of multiple sclerosis or even detrimental (51, 52). Access of biologicals to TNF produced by infiltrating cells within the CNS could explain lack of efficacy. In contrast, reported worsening of clinical symptoms may involve neurological side effects of the binding of TNF-directed agents to membrane-expressed TNF-inducing cellular apoptosis (53), or other effects via reverse signaling (54). The recent demonstration that glial-derived TNF may participate in control of synaptic strength (55) provides another explanation for detrimental effects of TNF blockade within the CNS. We thank Margit Homola for outstanding technical assistance with animal procedures; Lucia Guh-Siesel for providing some of the cDNA samples used in this study; Drs. Rene de Waal-Malefyt, Heleen Scheerens, and Edith Hessel for the establishment of TaqMan quantitative real-time PCR at DNAX; Dr. Anne O’Garra for maintaining the CCR8−/−.129SvEv mouse colony; the DNAX Animal Facility Staff for care of animals; and Gary Burget for graphics assistance. ↵1 DNAX is supported by Schering Plough. ↵2 Current address: Immunobiology Center, Mount Sinai School of Medicine, New York, NY 10029. ↵4 Abbreviations used in this paper: EAE, experimental autoimmune encephalomyelitis; GFAP, glial fibrillary acidic protein; IP-10, IFN-γ-inducible protein 10; MCP, monocyte chemoattractant protein; memTNFΔ/Δ, uncleavable, membrane-expressed TNF; Mig, monokine induced by IFN-γ; MIP, macrophage-inflammatory protein; MOG, myelin oligodendrocyte glycoprotein; PI, postimmunization; TCA3, T cell activation gene 3; WT, wild type. Sedgwick, J. D., W. F. Hickey. 1997. Antigen presentation in the central nervous system. R. W. Keane, and W. F. Hickey, eds. Immunology and the Nervous System 364 Oxford University Press, New York. Trebst, C., S. M. Staugaitis, P. Kivisäkk, D. Mahad, M. K. Cathcart, B. Tucky, T. Wei, M. R. S. Rani, R. Horuk, K. D. Aldape, et al. CC chemokine receptor 8 (CCR8) in the central nervous system is associatedwith phagocytic macrophages. Am. J. Pathol. In press.